Home / Accessories / Fireplace Accessories / Stove Catalytic Thermometer 1-5/8"
Innovative design for accurate measurement of gases immediately behind a combustor. 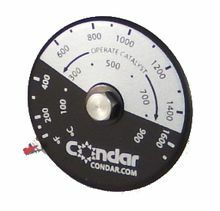 High temperature coil registers accurate reading up to 2000 degrees F. This stove thermometer can be retrofitted to most catalytic stoves to comply with EPA monitoring regulations. An indispensable tool for efficient wood stove operation, signals when to switch off bypass, and when to reduce fire to prevent degrading expensive combustors.